The Fox Hotel and Suites is Banff's newest hotel and will not disappoint. Waterfalls and mountain springs are brought to life in the Fox’s design. Capturing the historic and natural elements of Banff National Park, the hotel’s centerpiece is the hot pool inspired by the original Cave and Basin Historic Site. 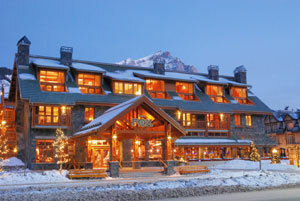 The Fox Hotel offers a unique ski accommodation style in Banff, with one and two bedroom suites and hotel rooms. Be sure to try Chili’s World Famous margaritas or watch the game on the HUGE 60" Plasma TV! Free continental breakfast is available to all guests staying at the Fox Hotel and Suites. The continental breakfast is served at Chili's Restaurant, just off the Lobby.